As this camping season wraps up you may be looking at your grill and thinking how much it needs a good cleaning before putting it away for the winter. It’s a job that few of us look forward to though we do love the feeling of bringing out our pristine and shiny grill again in the spring. The whole job can be done in about 30 minutes when you set up right and have your cleaning down to a system. 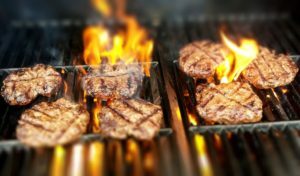 We’ll offer some tips for getting that grill sparkling clean in the shortest amount of time possible. A good pair of sturdy rubber gloves, grill brush, warm soapy water, glass cleaner, stainless steel cleaner, sponge, paper towels, scrubby pad, and a paint scraper. You can use the warm, soapy water on most of the exterior of your grill. Use the scrubby pad for stubborn areas. Once it is clean and dry you can use the glass cleaner and stainless cleaner to get a nice shine. Grill Interior: Once you take the inside parts apart you’ll find carbon deposits inside the lid. You can use your grill brush to remove these and then follow up with soapy water. Brush the bars and grates with your grill brush. Your burner tubes can be cleaned with the grill brush to clear any debris that has fallen on them and blocked the openings. You may need to use a putty knife to scrape excess grease into the drip tray and dispose of from there. You can see it done by watching the video below. Go ahead and give it a go. The job will be done before you know it and your grill will be ready to use when you are next spring. Your food will taste better and you’ll enjoy your cooking experience even more next summer.